With Dock 365, you can start your project off right by using our custom project portal capabilities for a seamless project management experience. As a project management professional, it’s critical to decrease inefficient communication with stakeholders or poor information management practices. Are you struggling with an unclear project collaboration standard that ultimately compromises your project’s success? Watch our video and read on to learn more. Build your project portal with as much or as little processes for your business needs. Your SharePoint site with Dock can bring together all the items you need to manage projects into one central, collaborative location under the Projects tab. Now is the time to take advantage of this for your project management needs. Utilize the straightforward dashboard that shows you how the project is doing with a summary of work, goals, project status, and so on. The Quick Launch can be personalized so the grouping and categorization mimics the project management processes that you use in your business. All the processes that your project will need can be built right in. Once you centralized your project information in your SharePoint site, we advise you to set up automated project processes, like changing the control process by utilizing built in SharePoint workflows. You can authorize alerts to automatically send out reminders to project stakeholders. This way, your team members can also view their upcoming tasks and be able to check them off as they go. Project Management Central is a turnkey project management solution that can standardize project sites, permissions and navigation consistency throughout projects in the enterprise. Set up 'Task Lists' in SharePoint in combination to plan tasks, activities and milestones with dates, assignees and build a breakdown structure for any project you're working on with multiple employees. You can also include additional lists tailored to specific project processes to manage risks, issues, change requests and more. With the 'Project Statement' tool, you can include an overview of the project, description, and key dates. All your team members and stakeholders on your project can have the ability to refer to it so that they can understand the purpose of the project or to get a summary of the high-level project information. In addition, control documents through the library to store deliverable by authoring, version control, and approval workflows. Keep your documents stored with your company intranet ensures that every team member is working on the same up-to-date document. You can setup additional views for work completed, in-progress, overdue, and more. Communicate project status to senior executives and other stakeholders. The reports can include KPIs with red and green indicator buttons to quickly show the project status visually. Add columns with your own commentary on what has been achieved, major accomplishments, issues, and planned next steps. Group web parts or project processes into phases such as: initiate, plan, track and close. SharePoint will guide you and your team to express how the project should be managed. As a project management professional, it’s critical to decrease inefficient communication with stakeholders or poor information management practices. Are you struggling with an unclear project collaboration standard that ultimately compromises your project’s success? The first step for any project with OneNote is to make sure your team is familiar with the software. It’s a promising idea to get everyone up to speed before taking on an important project. Moving forward with the idea that your team has access to OneNote and has the fundamentals down, let’s dive into how this software that comes with your Office 365 subscription can boost your productivity with project management. Microsoft Project & Portfolio Management helps you get started quickly and execute projects with ease. Built-in templates, familiar scheduling tools, and access across devices increase productivity for project managers and teams. 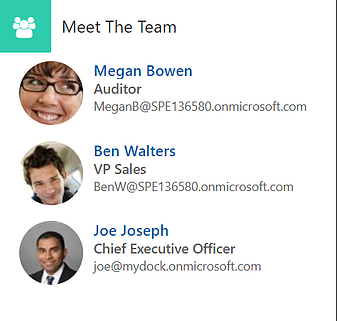 Microsoft management online collaboration tools made easy. If you're business works on creative projects or has a creative department that needs a better CRM system for their project management needs, we have some great tips about what to look for in a system made specific to their needs. To learn more about how Dock can specifically increase your project management productivity, the next step is to schedule a demo with one of our experts for online collaboration tools. Start tracking your projects and embrace powerful reporting tools today. Learn more about the way our project management portal helps you to keep track of each task, document, calendars and reporting to team members as well as stakeholders throughout the entire project. Below you can get a peek inside our project portal. Our new Project Management site is where you can make a list of active projects with due dates, priorities, project manager, percentage complete as well as an area to monitor RISK, Schedule, Budget, and Quality. Each project allows you to bring in a team to monitor progress and stay up-to-date on tasks. Dock features a “Timeline” in the form of a GANT chart to monitor the amount of tasks and work that has been completed in relation to the due date and time periods for each assigned task. A downloads section of forms/procedures for Project Requirements, Plans, Contracts, or Vendor Forms. Monitor data with a GANT chart of your project plans, budgets, schedules and quality control. 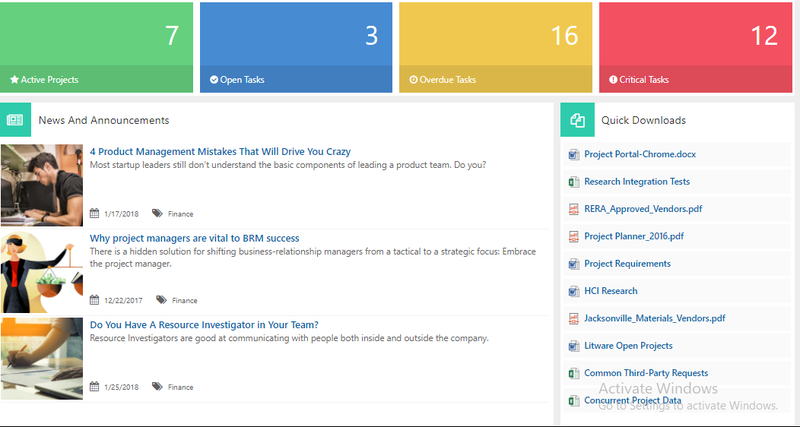 A project team section to communicate and collaborate quickly. A calendar overlay that sync’s directly with your Office 365 and Outlook calendar for your convenience. A task list where you can assign due dates, prioritize tasks, and see who the task is assigned too. You can also add it to the GANT timeline chart. A document center where you can filter and search by author, type of document, and tags.